Just Add Power 3G Ultra AV over IP components power a new video wall at the University of Indianapolis. Just Add Power CEO Ed Qualls and wife Pamela, University of Indianapolis alums, donate AV-over-IP solution that drives newly installed video walls at the school’s Health Pavillion. Utilizing Just Add Power 3G Ultra HD AV over IP components, the University of Indianapolis is informing on-campus students through a newly installed video wall in the school’s health pavilion. The AV over IP infrastructure was donated to the school by Just Add Power president and CEO Ed Qualls and his wife Pamela who are alumni of the school. “These video walls are a dynamic window into the student and faculty achievements taking place across the school,” says Ed Qualls. Serving as the backbone for the school’s state-of-the-art video wall are products from the Just Add Power 3G Ultra HD line of components. Providing the school with a flexible AV solution, the Just Add Power infrastructure is scalable to meet the university’s current and future media requirements, including the distribution of 4K Ultra HD with high dynamic range (HDR) content. Just Add Power points out that some of the options its product line offers include the ability to mix and match components depending on any number of performance and cost variables, as well as features such as the ability to perform audio extraction to downmix content from Dolby 5.1, and CEC control capabilities across system zones. 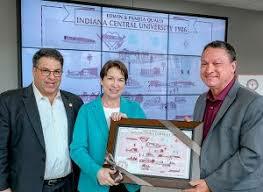 During the recent dedication of the video wall, the system showcased the heritage of Indiana Central College and the University of Indianapolis with vector-based images from the 20th century. “Ed, Pamela and Just Add Power have help the University of Indianapolis create a dynamic tool that can be used not only to inform the community, but to drive a canvas that is unlimited in potential, scope and scale,” says Robert L. Manuel, president, University of Indianapolis. “The video wall spotlights our students and staff, and the events taking place on campus.